We provide inspiration for our students everyday: a poem, a personal story, a famous quote, artwork. Music is also something that inspires students. They may enjoy playing it, composing it or performing it, but don’t overlook listening to it. Listening to music is the most basic of all ways to appreciate music and yet it is often overlooked as a means from which students become inspired to learn. Whether you are a music teacher or not, feel comfortable with music or not, listening to music can be part of your teaching repertoire. You can use listening experiences to teach, reinforce and enhance the curriculum you currently teach. In this mini-series, we have looked at the 3 ways we listen. And for the purposes of this type of integration, our focus is on listening actively. Unlike listening to music passively (with music as the background to another activity) or responsively (when you respond to the music by singing or dancing, for example), actively listening to music engages your brain as you think about what is happening in the music. The brain is active rather than the body. Sometimes people actively listen when they are trying to learn or understand the lyrics of a song. At other times, active listeners want to study the melody of a song, so that they can play it on an instrument. Often when people actively listen to music, they will imagine stories that are happening inside the music or even relate the music to their own lives. There are a few times during the day that can be set aside for listening time: first thing of the day, morning meeting, snack time, after lunch or at the end of the day. If you decide you want to use a listening experience for a one time project, then you will probably allow time to listen at the beginning of that class or lesson. Do what fits right with your teaching situation and the needs of your students. Take an In-Class Field Trip! These active listening experiences are similar to taking your students on a field trip. You give them experiences outside the regular norm and then build upon them when you “get back.” These listening field trips can be used as inspiration for your students to work on many different activities and assignments that connect to your curriculum. 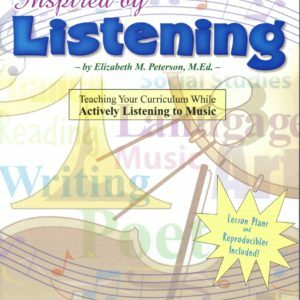 In my book, Inspired by Listening, these strategies of teaching through active listening are explained with practical uses for both music teachers and classroom teachers. If you are a music teacher, that’s great too! Actively listening to music is one of the best ways to teach your students about music theory, history and appreciation. Regardless, all you need is an enjoyment for listening to music. You can use Active Listening experiences all year long, for a one-time project or a mixture of the two. Every once in a while, we can take a listening experience and use it as inspiration to teach a lesson, especially in language arts. 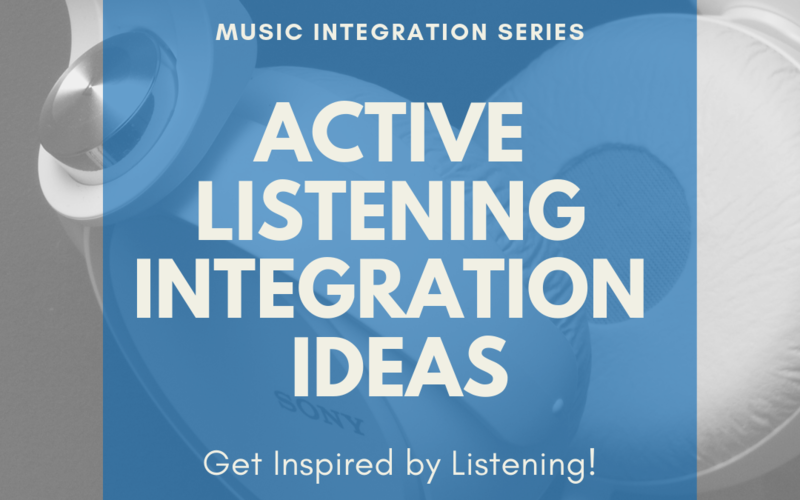 Other teachers who only see their students for one class per day or even just once a week will use Active Listening experiences at the beginning of their lessons to integrate the music into the content they are teaching. Students can practice their letter writing skills using Für Elise by Beethoven as they write the words and emotions they hear Beethoven speak in the music. During the study of a certain time period in history, listen to the music of that time. Discuss the composers or musicians of that music and why they chose to write the music the way they did. Study the lyrics or instrumentation of the music to take a peek into the times. Writing narratives is a natural extension using Sabre Dance by Aram Khachaturian. This exciting piece of music lends itself well to creating a story! When you are studying a particular culture, listen to the traditional (and current) music of that people. How is the music similar and different from the music of our culture? Actively listen to music that matches a certain season or holiday. Why is this music associated to the season? 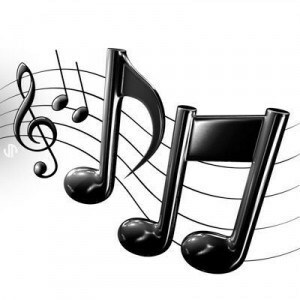 Are their clues in the instruments, the lyrics or the style of the music? Write an article about that! After listening to two different pieces of music, have students write a comparison paragraph. Have them use music vocabulary or focus on a part of speech you are currently teaching. But don’t think you HAVE to integrate all your listening time into your curriculum. Just providing time to listen to music with your students is enjoyable and rewarding as you share experiences together through music. Active Listening is a great way not only to encourage the integration of subject areas, but also the collaboration between teachers! For example, the music teacher can introduce the music to the students, continue to teach the students about the musical aspects of the piece and then the classroom teacher can use the listening experience to develop skills she is teaching in her classroom. Collaboration is fun for the students and, maybe more importantly, fun for YOU! (Yep. I said it!) Approach your colleagues and give it a try! in our cars, in our homes, on our computers, on TV; the list could go on and on. Not only is music everywhere, but it is motivating to young minds. Now you can add music to your repertoire of teaching tricks without being overwhelmed as you allow your students the chance to be inspired by listening! Let’s get to the freebie! This article’s freebie is going to be FUN. I’ve included instructions to lead you through an activity that will get you and your students creating poetry from a fantastic piece of music. A link to the music is also included, so all you have to do it grab the freebie, make copies of the reproducible and get started! 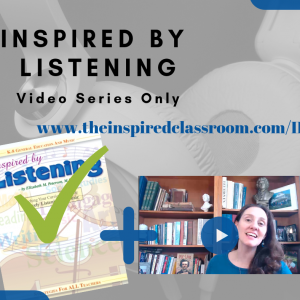 If you want to learn SO much more about Active Listening and how to bring these experiences into your classroom, you are in luck! My book, Inspired by Listening is a complete and comprehensive guide to how to introduce, use and integrate Active Listening experiences into your classroom. And you are reading this at the perfect time because I just came out with a video series where I take you step-by-step through the entire book so that you can implement the strategies confidently. It’s like you are taking a workshop with me!